We had a wonderful experience on the Divina. Our servers in the dining room were so fun and courteous that we only missed one night with them. 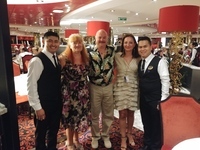 They shared stories about their on board life as well a their homeland. We were I the Villa Rossi MDR and our servers were Cosme and Eric. The food choices some nights were difficult to make. We booked a balcony Fantastica room and were pleasantly surprised by its spaciousness. We were very surprised that theroom was cleaned two times per day and the bed turned down at night - nice touch. We did not get the drink package and were more than okay having 12 drink tickets each. We could have whatever beer we wanted and they honored the tickets for frozen drinks. I have a lot of respect for the "abuse" the bar staff took from guests. A lot of guests were so impatient and unsympathetic towards the staff that it made me very sad. I pulled a few staff aside and gave then words of encouragement. MSC does need to hire more staff. We also appreciated the attempt by staff to control the lounge chair situation and removing towels after 30 minutes of non-use. The Divina is very clean and sparkly. What surprised us was how quiet the ship was at night. Compared to how many people were aboard, there was hardly anyone in the bars. We thought it would be loud and quite the party going on. We find it very relaxing. The entertainment staff went out of their way to entertain. They were always high energy and had a smile for you but weren&apos;t pushy to participate. I loved that you could get professional pictures taken with various backgrounds. The photographers were great and made you feel comfortable. Very spacious and clean. Lots of closet space and drawers. The room safe was very large. They&apos;re is a clothes line in the shower! The shower doors close in a way that give you more room in the bathroom. The bed was extremely comfortable and they gave you a pillow menu - yes, a pillow menu. We took a 30 minute bus tour to our boat and then about a 10 minute ride to the location. The water is only waist high so you can see the stingrays easily. It was terrifying and exciting at the same time. Spent the day walking around and went to a beach. Took a bus taxi to Carambola Beach and spent the day sunning and swimming. Gorgeous beach. We also swam with a turtle! The guides we very patient and took their time with people who were not confident. They were very fun. We saw lots of fish and afterwards went to a spectacular beach.